I unexpectedly enjoyed this one more than I thought I would despite the monotonous tone and the way that the story continued to drag on. There was progression within the seemingly lack of progression and the characters were interesting to follow and there was a slight case of the "FEELS" to be had. I maybe liked this one more than I liked Graceling, though Graceling seemed to have more story to it--maybe too much story, but I can't be bothered to remember much about it. The story feels like it's getting to a point of picking up now, but the first three chapters were kind of boring. I found my mind wandering as Fire and Archer traveled from one town to another, rehashing old memories and backstory, talking politics, and spouting way extreme feminist values that were probably a carryover from Graceling. It's been a long time since I read Graceling, but even then I'm not sure I found too much about it memorable. The world is developed really well and I like the characters as well, but the tone of the story is so monotonous that I find myself rereading paragraphs several times because I had stopped paying attention halfway through a sentence or something. Then some action happens, or an event is being spoken about, and I have to go back and reread other parts of the same chapter because I realized that my mind must have wandered a lot further back than I remember it wandering. I'm hoping things will get a little bit better since the concept and the story are quite intriguing to me. And also, the first two Graceling books were highly praised by a lot of reviewers. 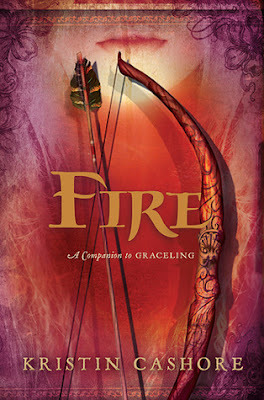 While I found Graceling to be mediocre young adult high fantasy that had potential to be pretty awesome but missed its mark somehow, I'm hoping that Fire will prove different. After Fire and Thorns, I'm still kind of on a quest to find another great high fantasy to quench my fangirl needs.